The legendary Flow Country Trail in Petzen is the longest mountain bike flow trail in Europe. 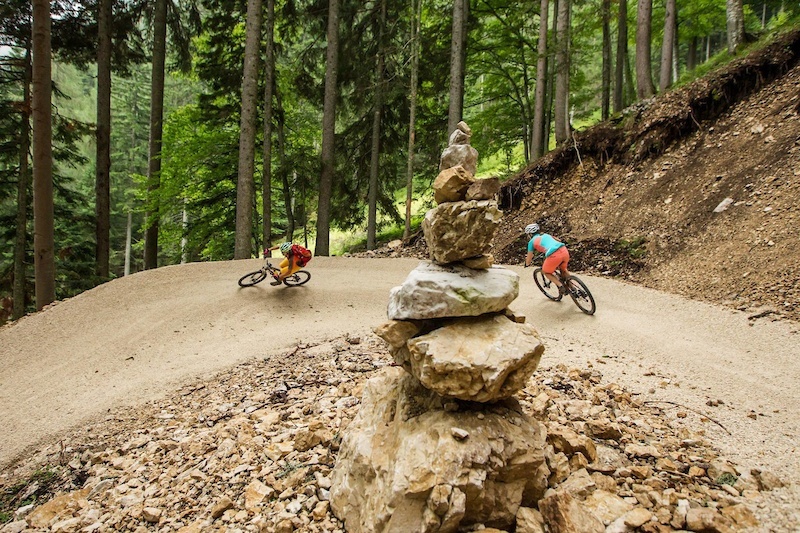 Built by a professional crew it opened two years ago on Mount Petzen in Carinthia and is 11 km long - an absolutely must ride for every mountain biker! In July, riding skills experts from the how-to website fahrtechnik.tv will host a flow camp with coachings and riding. Austria’s first certified “Flow Country Trail” was built by Diddie Schneider, one of Europe’s best mountain bike trail designers. The trail is ideal for beginners because it doesn’t require any specific technical skills. With your bike safely stowed, you can comfortably ride the mountain railway up to the trailhead. Then, on the way down towards the valley, mountain bikers can really show what they’re made of as they wind their way down the track and over jumps with fun waiting for them at every turn. The trail also offers panoramic views over the surrounding lake and valleys of Southern Carinthia, all inviting you to stop and enjoy. A training course with a dirt park and pump track as well as an area for children is also in the works for the area at the base of the mountain so that newcomers can get a feel for the sport. Exactly! All the turns and ugly bumps are missing! Depends on what you're riding. It seems like you'll be fine on a 4X hardtail if you've got the skills (and endurance). It is a trail for a big audience hence also rideable on many different bikes. Gondola is nice and very fast. In 8 minutes you are on the top and you need at least 20 minutes to come down again. Few hours after rain and the track is perfect for ride. Be careful, you can be easy to fast. First run always make it very easy to learn the track. A great day out after relentless rocky trails of Slovenia! I'm taking my lad there this summer, just hoping I can hire him a 20" bike for the day. That kind of trail is quite dangerous because you get incredibly fast on it. You don't even need suspension for that trail. A klunker would do just fine. where is the off road roller blader from a few months back? I'm really planing a trip there this summer . My question is since I haven't found anything clear about it , how to you get at top ? Is there a gondola or something ? @Meles: thanks for the info . Do you happen to know when the gondola starts running this summer ? @bogdanc: It's supposed to open on May 26th for the weekends and then from June 17th every day. Totally worth 3h drive up there! looks quite boring and repetitive to watch but i bet it's a dream track to ride! Looks like fun but I bet there is a lot of coming up behind slower riders.